Unfortunately 009 was represented with just one layout ‘Bryngoch’ and a publicity stand - note this lovely Darj train though. I have demolished the old hidden sidings boards, put the traversers up for sale on ebay and saved the wooden frame for future use. The reason for this? The far side of these boards feature a 1 foot by 2 foot section, which was to be used to store stock. This is just the perfect size for the proposed extension to the station board (required to sort out the alignment at the south end of the platform). It's also great because there are 2 of these pieces, as I will need to add the same amount of extra to the far side of the layout too. 9mm ply plus pine just like the boards they will attach to. Sat in a meeting where parts of it were in Dutch (!) I have completed my proposed design for the addition of this new woodwork to the layout. I will attach the pieces using L shaped strengtheners and will attach two new breakfast bar style legs over this new join to reduce any stress on it. 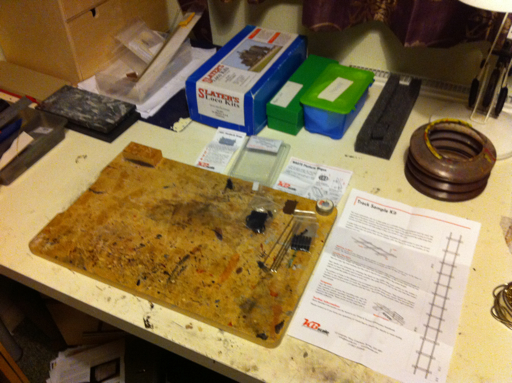 I cleaned up the old 2 foot square board ready to plan out my new O-14 shunting layout project and started using the fibre glass brush on the resin castings of my 16mm De Winton ready for painting in red oxide primer and then matt black. I'm using red oxide so that if any black misses when sprayed, the missed bits will look like rust! For those of you who couldn’t hear it at expoNG, or who didn’t make it, here is a quick video of the sounds installed in Castell Caernarfon. It’s a Loksound micro programmed with the closest sound I could get (some standard gauge continental loco called a SNCB/NMBS HLD 59 - Cockerill Baldwin-Westinghouse 12 cyl – images here http://www.belrail.be/F/fiches/diesel/index.php?type=hld59&page=image). It plugs into the 6 pin DCC socket on the chosen chassis – the new farish N gauge warship. The workbench has been cleared and some different projects are to be tackled next - a 16mm de winton for the garden and the starts of an O-14 micro shunting layout that can live inside. I have a 2 foot square board ready! The plan is to develop it as a kind of shunting challenge. I also want to add the decoder to merddin and replace the dead motor in 143.